Businesses trust material handling equipment (MHE) providers for automated guided vehicles (AVG), conveyors, robotics, sortation, storage and beyond. Top to bottom, material handling manufacturers outfit warehouses with the latest and greatest. This goes beyond automation hardware—on the back page of a MHE provider’s RFP, you can often find a warehouse control system (WCS) bundled into the deal. A prevailing thought is if the manufacturer made the hardware, they must have the software to go with it; an apples-to-apples scenario. Others are sold on the deep discount of an MHE provider’s own bundled WCS. But, there’s a component missing here. It’s the one thing automated warehouses need to stay competitive but struggle with. What is this missing link? Agility. We all know the WCS manages automation hardware, and the WMS manages inventory and business processes. But, how can warehouse operations be agile if the communication between WCS and WMS is basic at best? In today’s climate, where the consumer is empowered to change orders at any moment, agility is the ability to pivot and keep orders moving. It’s not just a matter of having a WMS and having a WCS. The integration between these systems, specifically the quality of data transferred, is a game-changer. Let’s say you’re at a dinner party surrounded by people speaking different languages. If there’s no common language (or Google Translate), the evening might devolve into simple gestures and exchanges topping out at a first-grade reading level. As much as I enjoy Charades, it will only get you so far. The conversation is going to be much faster, smoother and enjoyable with a translator filtering the dialogue. Putting this in perspective, businesses ranging from big-box retail to niche B2B are processing higher volumes of single-line orders. There are less issues when materials flow linearly from Point A to Point B. But, with order changes, cancellations and machinery malfunctions, how often do warehouses operate in straight lines? Many automation systems struggle with order changes because of blind spots. The WCS may be aware that the order is on a conveyor, but the WMS is unaware until the package is scanned. This loss in translation slows down flow and invites potential errors in fulfilment. The best solution is agility. Agility goes beyond constant inventory visibility from pick, pack, label and ship stations. With a flexible WMS that allows businesses to build processes for their unique circumstances and a WCS that integrates equally with the WMS and hardware, automation systems can remediate instantly without human intervention. Margins are too tight, shipping windows too small and customer expectations too high for warehouses to stop and fix the issue and then hit the reset button. When operations go sideways, the WMS, WCS and automation hardware must function as one. Many WCSs can perform some troubleshooting. But, the reality is that many WCSs collect a wealth of information that is rarely sent back to the WMS—operational health and inventory location being two major examples. If a conveyor malfunctions, typically operators notice first. The operator might circumvent the jammed conveyor, and the WCS sends a basic communication such as “No” back to the WMS. The WMS doesn’t know about the larger issue of a malfunctioning conveyor. Therefore, it will repeat the process for subsequent orders, creating a log-jam at the conveyor. In circumstances like this, businesses can’t build integrations or processes that eliminate downtime or operator intervention. But, it is possible to navigate these issues without interrupting the flow of materials. With a WCS designed for one-to-one integrations with a WMS, businesses benefit from a continuous exchange of detailed information. This opens new avenues for tighter automation processes. Prioritization: The WMS handles inventory and orders more efficiently. Route optimization: The WMS learns the path of least resistance when allocating materials, in real-time. This enhanced visibility and data exchange brings immense benefits when it comes to labour efficiency, inventory traceability and downtime. It’s worth mentioning warehouse execution systems (WES) as part of this conversation. The key differences between WES and an automation-aware WMS are the depth and breadth of functionality. A WES is typically a hybrid blend of a WMS and a WCS. A WES will have some functionality from both, pieced together as one technology layer. An automation-aware WMS is the seamless integration of a full-fledged WMS and a brand-agnostic WCS—providing a complete toolset for truly flexible warehouse operations. Because of the huge capital expense, businesses focus on getting the hardware right. But, automation is just as much about software as it is nuts and bolts. It’s a domino-effect businesses need to think about in the early stages of building business requirements. As the maestro guiding the hardware, you aren’t getting the most out of your MHE without a powerful WCS. And, you aren’t getting the most out of your WCS without a deep connection to the WMS. Would you buy a Ferrari with a restrictor plate tacked on? No. We all want the full potential of our hardware—especially when there’s a big price tag. Businesses should have “agility” as the key requirement for their automation stack. And an automation-aware WMS is the pivotal technology layer making this possible. HighJump: supply chain accelerated. 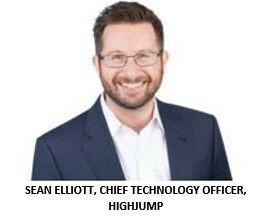 For more information, visit http://www.highjump.com . HighJump is a trademark of HighJump Software Inc., registered in the U.S. and other countries.